Everyone looks on with concern as Sally has seizures. Thomas came over and hugged Mommy, seeing her concern. Watching all of the seizures take a toll on all of us, especially the boys. Hi Everybody – We hope everybody enjoyed their holidays. Ours was certainly busy between seeing family and several medical appointments. It was great getting to see family and friends, and also an opportunity for them to see first-hand what Sally is battling as they all experienced the seizure activity we’ve been seeing. Inspecting the presents Christmas morning, it was her first time opening them on her own. 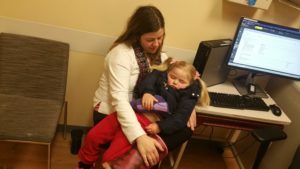 Most of the time, these three types occur in a single span, where Sally will have a 1-4 minute absence seizure during which she’ll experience myoclonic jerks and one or two tonic seizures. 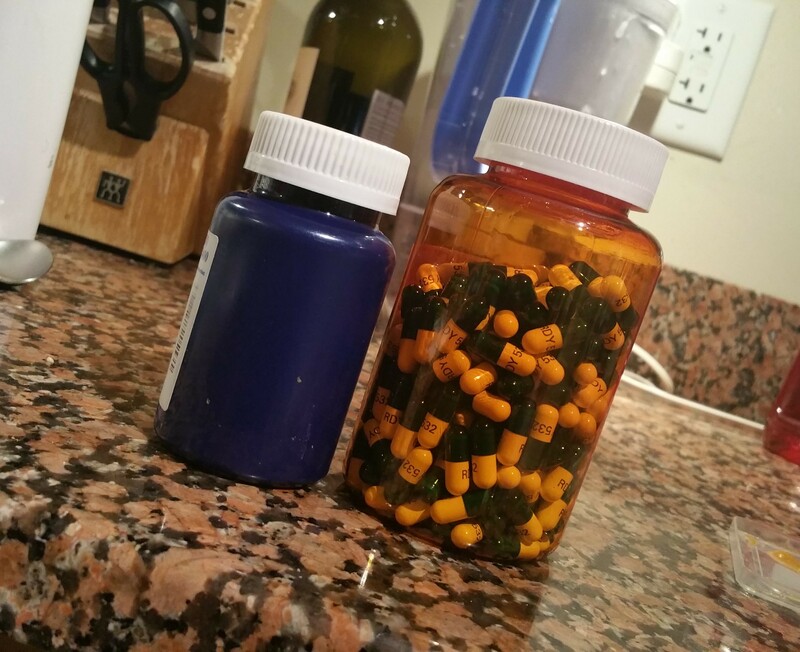 During and before our hospital stay we were sometimes seeing a combined 50+ of these seizures a day. The team decided to increase her Depakote drug dose to its max level to see if we could stop the downward trend, and planned to do so incrementally over the coming month after initially raising it while admitted. We also began weaning her off of cannabis, which so far has not been shown to have had a positive effect on her. What the increase in Depakote looks like. After Christmas we went to have blood drawn at NYU and learned that Sally’s Depakote levels were actually too high already, and that her platelet levels had dropped significantly which is one of the side effects. Doctors informed us that we would be unable to raise her dosage further as planned, and would actually need to reduce it slightly. Over the last two weeks Sally has continued to be very tired during the day, most days still sleeping at school and not having the endurance she had in the early fall. We’ve seen a slight increase in absence and tonic seizures, however fewer myoclonic jerks. School has said they’ve seen an increase in her cognitive learning and behavior. These are mixed results, but feel like Sally’s rapid decline has slowed or even potentially stopped for now. She’s also had “good days” with overall less seizure activity, although still has “bad days” with lots of seizures, but so far it looks like the increase in Depakote has had a positive effect. It’s a start. 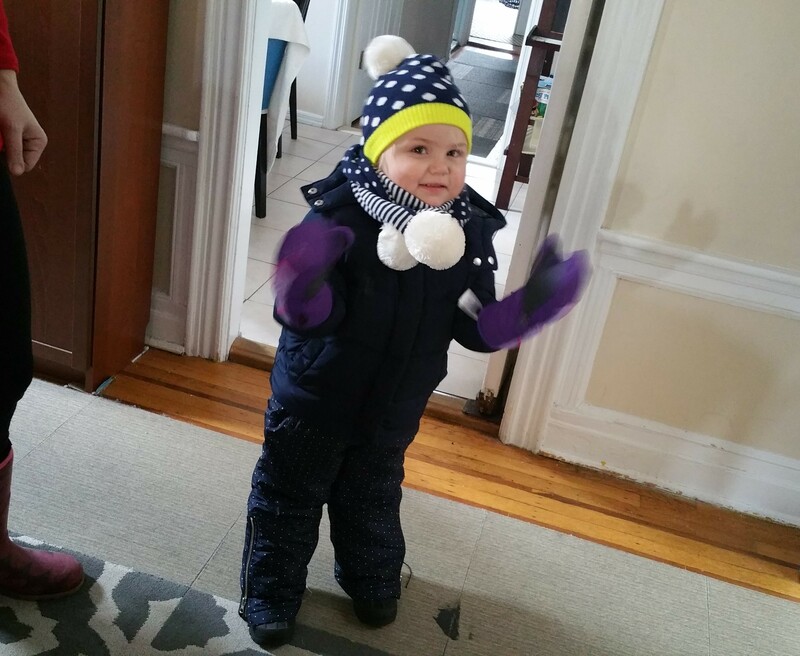 Excited to go build a snowman. Although we feel we’ve slowed/stopped the downward spiral for now, Sally is still experiencing several seizures a day. As our NP put it, every seizure is like a mini-concussion that affects the brain long term, so we need to continue to search for a treatment that eliminates the activity or at least minimizes it. In the hospital we discussed steroid treatment as the next option, however Sally was sick at the time so wasn’t an option. There were also several things that would have to happen before going down that road, including a conversation with Sloan Kettering. Sally’s white cell and ANC counts in recent weeks have been the lowest since she’s been on treatment showing that her immune system is on the weaker side. At this point none of the medical staff, including MSK, is too concerned. The steroids would supress these counts even further, so likely isn’t an option right now because it would leave her immune system compromised. There are also some other drugs we can try, but those carry with them more significant side effects with greater risk because she has had so much chemotherapy. Sally slept through the entire appointment with Dr. Devinsky’s team. Today, Dr. Devinsky and team have decided to put Sally on a modified Atkins diet, similar to the Ketogenic diet. We’ve heard many cases of kids having success with this diet, which is high in fat, you can learn about its potential effect on seizures here. It’s also going to be a challenge as Sally won’t be allowed to eat much of the food she enjoys including fruit, pizza and sushi. She also doesn’t have the oral strength/stamina to chew most meats due to the fact that she didn’t eat by mouth for over two years, so are anticipating this being an uphill battle. We could see changes in as quickly as a few days, or as long as two months so will need to try it for at least that period of time. Although many kids have success with it, none of the post treatment chemo-induced seizure kids we know have had long term success with the diet stopping the seizures. 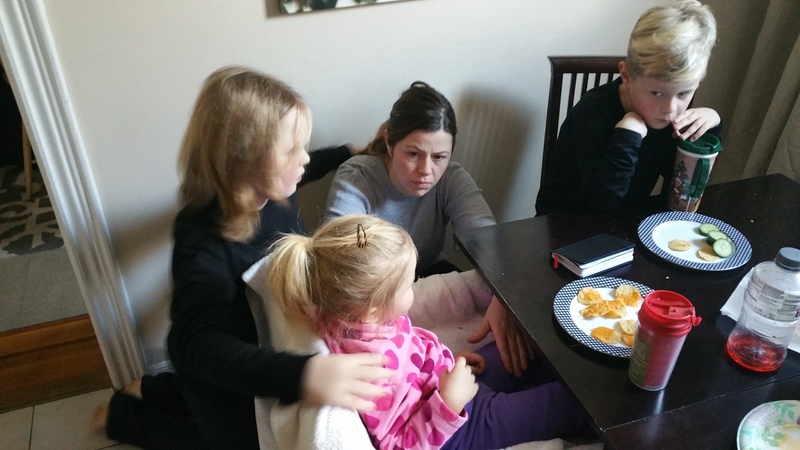 These other families are our barometer for what we can usually expect, but are still hopeful. Many of these kids remain on the diet regardless of success treating the seizures as they feel it has a positive impact on their child. 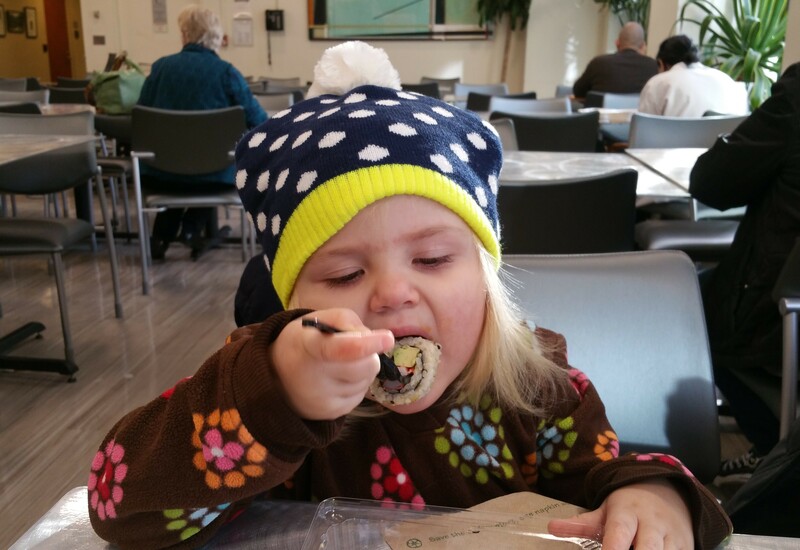 Sally loves eating sushi at Sloan Kettering, sadly she won’t be able to enjoy it anymore on the new diet. Tomorrow we meet with the nutritionist in Dr. Devinsky’s office to learn how to implement this diet as they want to get Sally started on it ASAP. We’ve got a lot of work to do in finding foods that Sally will like and that she can chew. It will also impact our whole family as it wouldn’t be fair to eat things in front of Sally that she wants but can’t have while she adjusts, although is something we’re used to with William having Celiac Disease. In the meantime, we’ll continue to monitor Sally and see how this goes. Over the holidays we also had our checkup at Sloan Kettering, and other than the low counts everything with Sally looks good from their perspective. 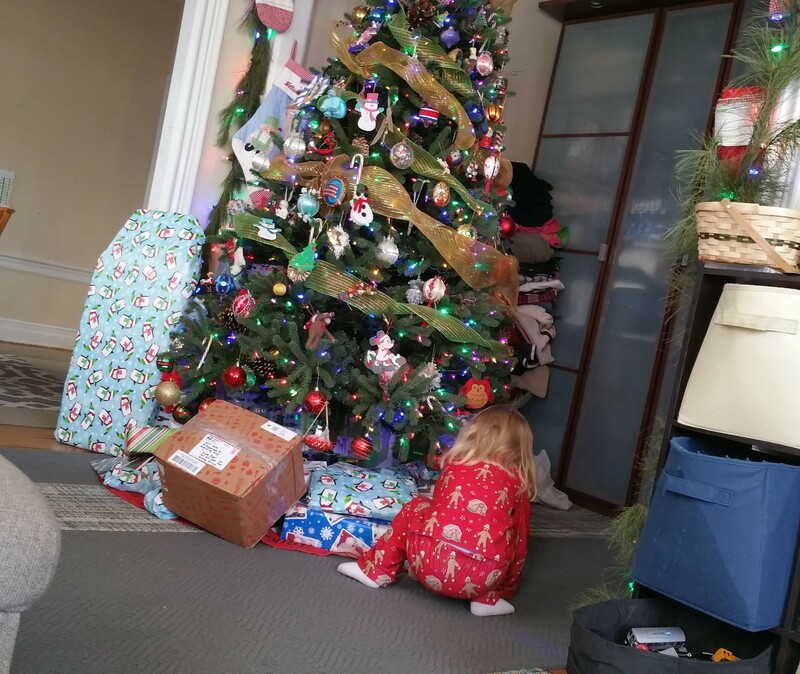 Always great news, and our own little Christmas present, as well as a reminder to keep things in perspective. Prayers for you all but praying really hard for Sally. Keep fighting that fight, Matt. We are praying for Sally and your entire family. Thank you for your detailed updates. They make it clear how strong all of you are! Jonathan had a lot of texture issues when he was young. He would stick his hand down his throat bc of the meat texture. Then we started using the pressure cooker and it helped a lot. Adding some Indian curry flavors (especially tumeric and ginger) didn’t hurt. If you do this already, ignore. Just wanted to share. Sally is our hero. So are her brothers! I pray for Sally everyday. I wish I could do more. I hope this new diet will help. It is very encouraging that her cognitive learning and behavior are increasing. Your family has endured so much I pray you will receive the best reward – a healthy happy Sally. Never far from our thoughts and always in our prayers. Sending lots of love and hugs and hope that the diet will work. Love & prayers continue for Sally & all the family. Always praying for Sweet Sally. I am not sure if this would be helpful, and if you already know about them then please ignore this, but there is a group called the MaxLove Project. They focus on supporting kids with cancer and their families through treatment and beyond with whole kid wellness. One of their programs has to do with helping implement a ketogenic diet. I know what you are doing is slightly different, but they might have some recipes and tips for dealing with challenges that are of some help to you. I know they also have product recommendations for things like bread, etc., that meet the guidelines of the ketogenic diet. Here is the link to their website, specifically their “Fierce Foods Academy” page. They offer online support for families, too, which might be helpful. http://www.maxloveproject.org/fierce-foods Good luck to you all with these challenges. I hope you see more improvement in Sally soon. Will continue to pray for Sally and your whole family. That she will like her new diet and it will help the seizure activity. God bless your whole family and may He continue to give you strength to continue to battle for Sally.